Still Life with Pears by Hal McIntosh. Born in 1927, McIntosh began his formal studies at the Detroit Art Institute in Detroit, Michigan, and the Toledo Museum of Art in Toledo, Ohio. At age 18, the Art Research Studio (present-day Maitland Art Center) in Maitland, Florida, selected him as the institution's youngest-ever artist in residence. His talent later earned him the Directorship of the Academy of Fine Arts in Lynchburg, Virginia, where he served as a museum director and teacher for five years. As a resident of Central Florida, McIntosh taught at the Loch Haven Art Center in Orlando and ran his own institution known as the McIntosh School in Winter Park for 30 years. McIntosh splits his time between his Cape Cod, Massachusetts, and Winter Park studios. With an artistic career lasting over 60 years, Hal McIntosh's influence on our community is profound. His bold abstractions, tranquil waterscapes, and stirring portraiture, all masterfully painted with a touch of McIntosh's signature Orientalism, have been widely exhibited in the area and are part of numerous regional collections, both private and public. Deep connections with the people and places of Orange County have allowed McIntosh to join the ranks as one of the greats and to be remembered eternally as an Art Legend. Original painting: McIntosh, Hal. Still Life with Pears (painting): Albin Polasek Museum & Sculpture Gardens, Winter Park, Florida. Digital reproduction of original painting: McIntosh, Hal. 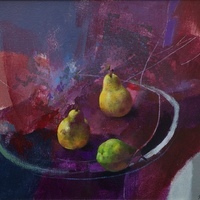 Still Life with Pears (painting). Originally created by Hal McIntosh. Copyright to this resource is held by Hal McIntosh and is provided here by RICHES of Central Florida for educational purposes only. Bishop, Philip E. "Winter Park Artist Mcintosh Spices Life With Variety." The Orlando Sentinel, February 15, 2005. http://articles.orlandosentinel.com/2005-02-15/news/0502140273_1_mcintosh-koi-painting. Hummel, Terry. "A must-see show in Eustis: Lake Eustis Museum of Art shows works by Hal McIntosh, Maury Hurt, Bill Orr." The Orlando Sentinel, November 3, 2011. http://articles.orlandosentinel.com/2011-11-03/entertainment/os-hummel-art-events-orlando-20111103_1_area-artists-artists-share-art-galleries. McIntosh, Hal. 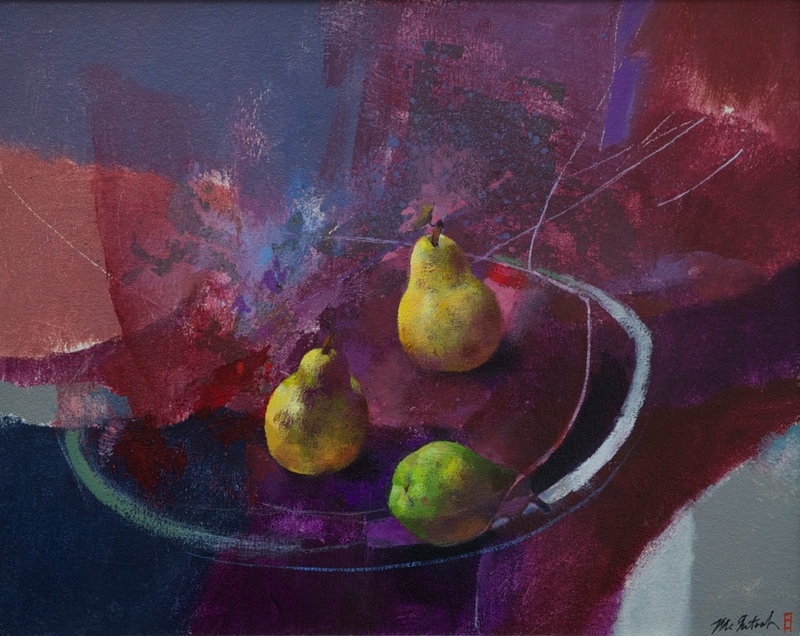 “Still Life with Pears by Hal McIntosh.” RICHES of Central Florida accessed April 22, 2019, https://richesmi.cah.ucf.edu/omeka/items/show/5292.